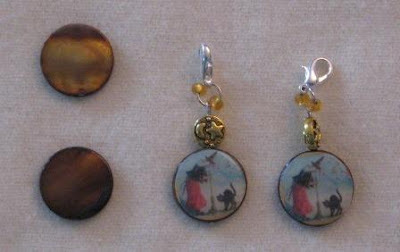 Here are two charms on the right that are finished for a swap on Two Peas in a Bucket. 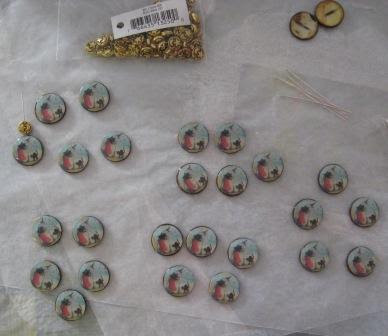 The left has the 20mm shell disk beads that I started with and still show on the back side. I thought they looked like the harvest moon. I printed small images of an old postcard. 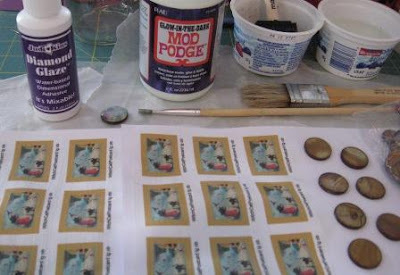 Sealed them with Mod Podge (Glow in the Dark). When dry, I used the light table and traced the circle on the back side and cut it out. Then glued the images to the 20mm shell disks. When dry again, I used Diamond Glaze to cover over the image for a good raised glaze. You have to try not to get bubbles in the Diamond Glaze. Here are the many disk images drying before I can add more beads. I placed the disk bead on a 1 1/2" jewelry pin head and added the gold moon and star bead. 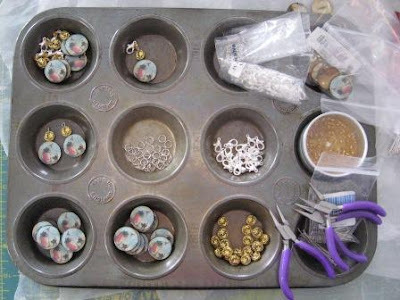 I love to put the charms together using my muffin tins. I have bought a few old muffin tins to use for project trays. I look for them at the second hand stores. This can then sit on my lap in from of the TV or at a table. Cathy, these are so cute! I love Halloween and I love vintage!!!!!!!!!!! SUPER AWESOME JOB!